In order to better understand and maximize FreshWorks' impact, TCE commissioned a two-year evaluation of the program's food access, social, and economic outcomes. The evaluation also sought to document the development and implementation of FreshWorks while identifying key lessons and insights. Given that FreshWorks is an early example of a statelevel fresh food financing initiative, the evaluation provides an opportunity to inform the greater healthy food movement going forward. The evaluation was led by a team of researchers experienced in evaluating health, social and economic outcomes. The team consists of the Sarah Samuels Center for Public Health Research and Evaluation, PCV InSight, Dr. Allison Karpyn of the University of Delaware, and Dr. Karen Glanz of the University of Pennsylvania. 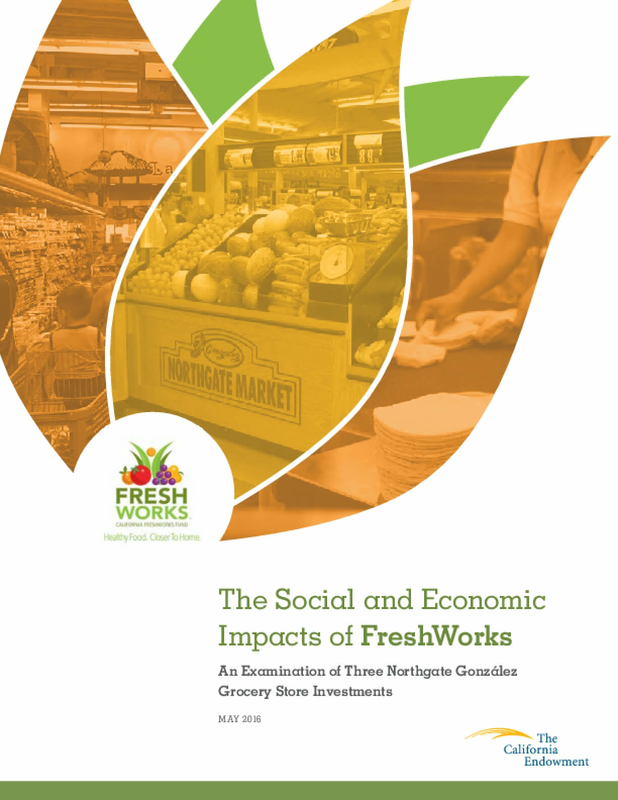 This report, one component of the evaluation, focuses on the economic and social impacts of the three Northgate González stores funded by FreshWorks. It seeks to answer two key research questions: * How does FreshWorks impact employment and job quality of workers in local communities, particularly in underserved communities? * What broader economic impacts do FreshWorks investments have in the communities where they are located? Copyright 2016 by The California Endowment. All rights reserved.